Scoliosis is a curvature of the spine that is measures greater than 10 degrees on a radiograph (x-ray). 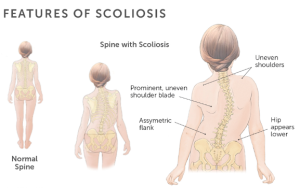 Scoliosis causes the bones of the spine to twist or rotate so that instead of a straight line down the middle of the back the spine looks more like the letter “C” or “S”. Scoliosis curves most commonly occur in the middle back (thoracic spine) but can also occur in the upper and lower parts of the spine. Although it can develop in young children, idiopathic scoliosis most commonly begins during puberty. Scoliosis curves are classified in three ways, based on cause, location and direction. The causal classification system is the most common and includes two major descriptions of scoliosis, identifying them as either structural or non-structural. When classifying scoliosis by cause, there are two major categories, structural and non-structural. In most cases, the cause of scoliosis is unknown and will be classified as idiopathic. Small curves typically go unnoticed until a child hits a growth spurt during puberty but scoliosis can occur in children as well. Childhood classification of idiopathic scoliosis depends on the age of onset. If the onset of the curve occurs before 3 years old it is called infantile idiopathic scoliosis. If the onset is between 3-10 years old it is called juvenile idiopathic scoliosis. Over the age of 10 years old it is classified as adolescent idiopathic scoliosis. Congenital scoliosis occurs due to anomalies of the vertebrae or ribs that are present from birth. The most frequent anomaly is a hemivertbeae, block vertebrae, spina bifida, bridging, fusion of ribs and other rib malformations. Neuromuscular scoliosis develops secondary to problems during development of the spine. Often, the bones of the spine will not form completely or they will fail to separate from each other, which results in a curvature. 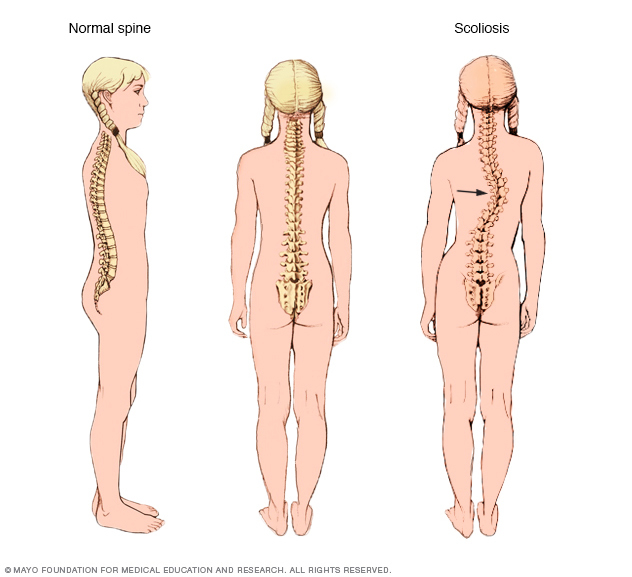 Scoliosis is caused by the alterations in the structure of the spine and may occur with the following conditions: Marfan syndrome, muscular dystrophy, and cerebral palsy. Differences in leg length are common in asymptomatic and low back pain individuals. Many leg length differences have no know cause. The only way to diagnose leg length inequality is via a standing radiograph, which we take at Mountain Health & Performance. Leg length inequality can occur due to trauma (i.e. : broken thigh or leg bones), can be present from birth or can occur due to arthritis, compression fracture, and unlevel pelvis. During an acute episode of low back pain (facet joint irritation, disc herniation etc.) there may be spasm of muscles on one side, which causes the spine to tilt towards the side of pain. This can cause a compensatory curvature of the spine. For minor curves that are less than 20 degrees, the patient will not require bracing but if they are between the ages of 10-15 years old their curve should be closely monitored for progression. X-rays every 3 months should be done as part of this monitoring process.Curves with the highest change of progression should be braced. Your doctor and chiropractor can help you to determine the severity of your child’s curvature. If the scoliosis causes noticeable deformity or is at high risk of doing so a brace can help to prevent the curve from getting worse. A brace is typically worn until the adolescent has reached skeletal maturity. If an idiopathic scoliosis continues to progress despite bracing and reaches +40-50 degrees, surgery may be considered. 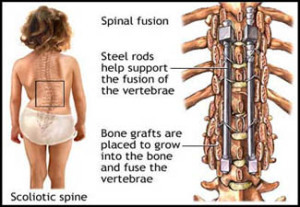 Surgery may involve: spinal fusion along with rods, screws, hooks and or wires placed in the spine. The most common surgery performed includes the insertion of Harrington rods and the Dwyer procedure of wire cable and screws. For structural scoliosis hands on therapies (chiropractic manipulation, massage, mobilization) will NOT reverse or change your scoliosis. However these therapies can be very helpful for improving posture, flexibility, muscular tone, and overall body awareness. These therapies can also play a large roll in pain- management if scoliosis leads to compensatory patterns that cause pain. For scoliosis due to spinal injuries (disc herniation’s, hip contracture, sciatica) the cause of the scoliosis is secondary to an underlying spinal condition. Chiropractic manipulation, laser, myofascial release and rehab can help you to recover from disc herniations, sciatica, and acute low back pain thereby helping to reduce compensatory curvatures in the spine.